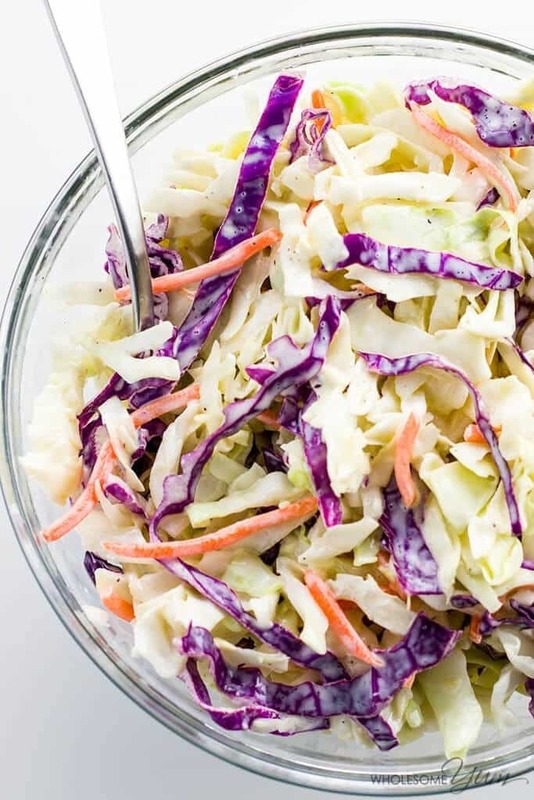 This sugar-free, paleo, low carb coleslaw recipe needs just 5 ingredients. Creamy, delicious, and you can make it in 5 minutes. I have to be honest, guys. I’ve hardly had any time for cooking this past weekend. I mentioned in last week’s low carb chili recipe post that we have some home projects I’m trying to get done before the baby comes, so we’ve been totally focusing on that. The latest one turned out to be a bit of a fiasco and inadvertently consumed most of our weekend. As a result, dinner was a last-minute ordeal. I pulled some ready-to-go coconut chicken tenders out of the freezer and whipped up my favorite five-minute salad recipe – paleo, low carb coleslaw. It all started a few weeks ago, when I decided to convert our formal dining room into a playroom with white furniture and a contrast wall. We bought a miniature kids’ table, modern white ottomans, some white cubes and storage closets with glass doors. There was just one problem. The modular closets I fell in love with had dark brown trim around the glass doors, which wouldn’t go with the rest of the white furniture. After much hesitation, my husband and I decided we were going to paint the trim white. Worst of all, we didn’t anticipate how badly the house would start to smell of spray paint – when it was 16 degrees Fahrenheit outside! Even though we did the work in the basement, the furnace circulated the fumes throughout the entire house. I don’t know what we were thinking. We had no choice but to open nearly all the windows, turn on the gas fireplace, and walk around with our coats on. Needless to say, this project didn’t exactly go as planned. The doors are still drying in the basement, but at least so far the end results do look good – even if it did take so much more effort than I’d envisioned. So, like I said, dinner consisted of chicken from the freezer and this creamy, low carb coleslaw. Speaking of which, how have I not shared it with you guys yet? I’ve probably made it a gazillion times. 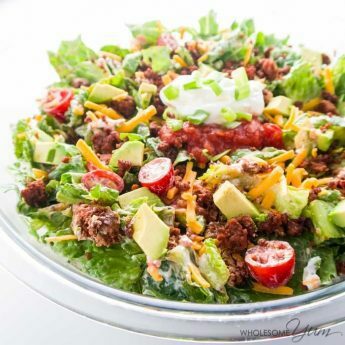 And, it’s the easiest low carb salad ever. 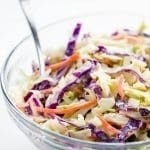 This paleo coleslaw does taste best if you make it in advance. Fortunately, it keeps extremely well – even for multiple days – so you don’t have to time it too precisely. Even if you’re in a pinch and realize you have no side dish for dinner, you can make it work. 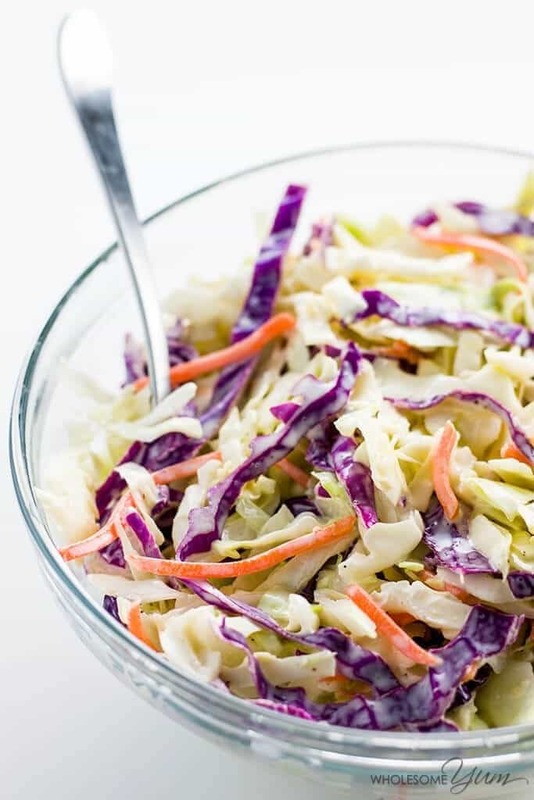 Just throw together this low carb coleslaw before preparing your main dish. Stick it in the fridge and it should be good enough by the time the rest of your dinner is ready. Place the shredded coleslaw mix into a large bowl. Set aside. 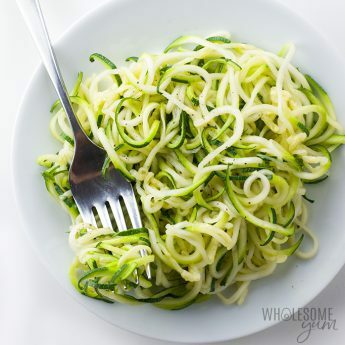 In a small bowl, whisk together the mayonnaise, apple cider vinegar, erythritol, and celery seed. Season with sea salt and black pepper to taste. Stir the dressing into the shredded coleslaw mix and toss to coat. If you have time, refrigerate the coleslaw for at least an hour (or overnight) to let the flavors develop. Stir again before serving. Serve chilled. Use powdered sweetener for smoother dressing. 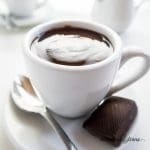 If you prefer to avoid erythritol for stricter paleo, any other sweetener like coconut sugar will also work. Click or tap on the image below to play the video. 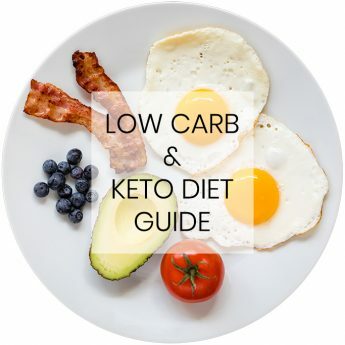 It's the easiest way to learn how to make Keto Coleslaw! Bleeeck…way too vinegary. 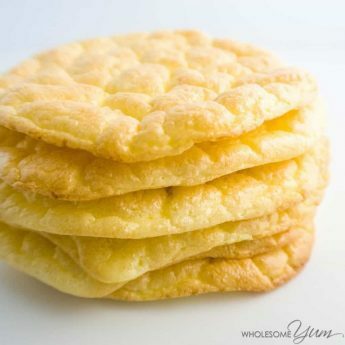 I say omit the vinegar completely and use a tablespoon of lemon juice. 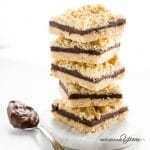 I’ve been using your site for 9 months of recipes! 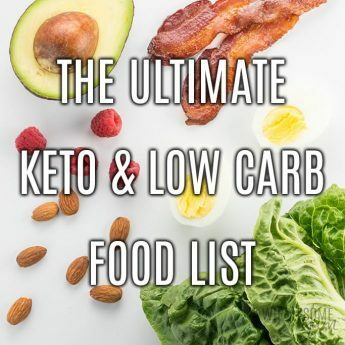 It’s my Go To for low carb recipes. Thank you Maya for all that you do. This is the very first one I’m not fond of … it tastes “off”. The only thing different I used celery salt instead of seed (and only used half a tsp). Maybe it’s the Apple cider vinegar? I’ll try again next time with regular vinegar. Thanks again and keep up the awesome work! Hi Dree, Thank you for the feedback. If you’re not a fan of apple cider vinegar, you can try white vinegar if you don’t need it to be paleo. So good, best coleslaw I ever had. Thank you!! This coleslaw was sooo good! Served it for company and everyone loved it. 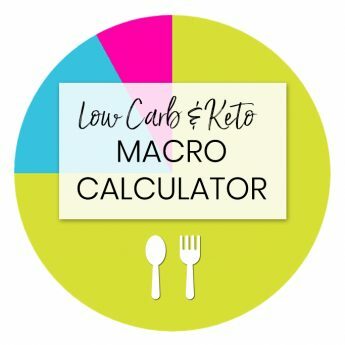 Thank you for a great low carb side dish! I am so happy you liked it, Nancy! Thank you! I had a large bag of coleslaw (16oz – says 5 2-cup servings but it was maybe 5 loose cups worth?) but I didn’t want too much vinegar flavor (BF doesn’t like the taste/smell) so I just doubled the mayo and the spices. My version listed below. Thank you for sharing with us, Alex! I am so happy you liked it! Just made this for dinner tonight. Yummm, now it has to make it until dinner. And so easy. I think I’ve found my new salad dressing too, the dressing is yummy. Thank you. I am so happy you liked it, Debbie! Love the flavors, wasn’t quite creamy enough for us, so next time I made it I added a bit more mayo/ACV. Great idea, LeeAnn! Thank you for sharing with us! I follow a pre-purchased menu planner. Today, for lunch, we had BBQ pulled pork sandwiches and coleslaw. The pork was great. The coleslaw was ok, but not as good as the one I used to make. When I thought back to the ingredients I put in, I realized there was no sugar in this coleslaw recipe. Well, no wonder it wasn’t as good. lol! As horrible as sugar is for you, give credit, where credit is due…it has a great flavor. We are trying to cut back our sugar, so I didnt want to add sugar in the next batch I made, but I wondered if there was another non-sugar coleslaw recipe that might taste a bit better. On to Pinterest I came. Yours was the first recipe that popped up. Your recipe has the EXACT same ingredients in it that the one I made today had in it, with the exception of the addition of Erythritol. I’ve never tasted (or even heard of it), but I’m willing to give it a try if I can find it in my local health food market. 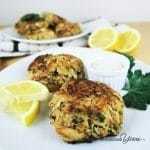 Thanks so much for sharing this recipe. I can’t wait to try it. I really hope you liked it, Audrey! Have a great day! Just made this…………I’m super impresed on how great it turned out. It taste delicious. This will be my go to recipe from now on. Easy and good!!! Hi Karen! I am happy you liked it. Thanks for stopping by! I had a coleslaw similar to this only last night, what a coincidence! Shredded cabbage makes for a great salad, you just can’t beat the classics. My mouth was watering as soon as I saw your first picture! Looks delicious! It always takes us much longer than I initially predict to do projects. I have it in my mind how it should go and then reality sets in. lol. We, too, spend lots of time running back and forth to the store. Over the years we have gotten pretty good and have trimmed out windows, added wainscoting to rooms in the house, re-trimmed doors and baseboards, made a day bed and even made a beautiful bathroom vanity from scratch. Two things come from our projects: 1. that feeling of satisfaction you get upon seeing your beautiful completed project 2. dinner is usually fast food! I love that you made dinner at home after your long day. 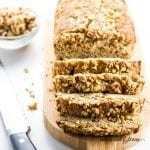 This fast and easy recipe is perfect. Thanks for the story and the recipe.